It’s that time again . . . time for that horrid Grinch to try to ruin Christmas. 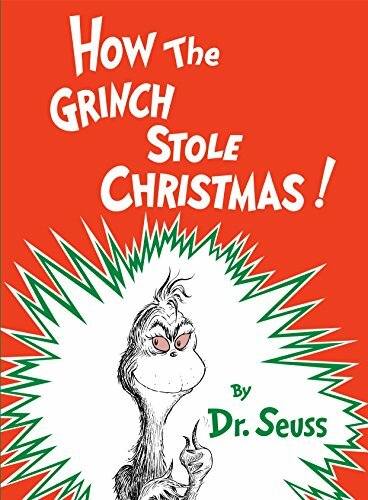 In Dr. Seuss’ unforgettable holiday classic, How the Grinch Stole Christmas, readers young and old are welcomed into the gooey-sweet world of the Whos of Who-ville and the red-eyed world of the surly-faced Grinch. As the Whos light their windows, hang their stockings, and trim their Christmas trees, the Grinch peers down his turned-up button-of-a-nose at the noise and happy festivities that Christmas brings. Then he hatches a plan. He can stop Christmas if he can figure a way to steal it. And what better way to steal it than to impersonate Santa? A thin, sour-puss-faced, red-eyed Santa . . . but Santa, just the same. So he dons his Santa suit and bullies his unwilling dog into serving as his reindeer. Then he’s off to steal toys, Who-pudding, and Who-roast-beast—and probably even the Christmas songs, if he can only figure out how. The only problem is that just when he thinks he has finally succeeded in his dastardly caper, the Whos show him that he has never known the true meaning of Christmas at all. Yes, “you’ve seen this movie before.” We all know the lesson the Grinch learns (except maybe the youngest readers, but they’ll find out soon enough, right? ), but isn’t it wonderful that every time we read this story is like the very first time? Dr. Seuss’ prose is superb. It is also fast-paced, and laugh-out-loud funny, and his rhyme and meter are so precise that they leave the seasoned reader (and writer!) speechless. Enjoy this book in the early elementary classroom, as an example of pristine rhyme and meter in an advanced poetry classroom, or as a holiday favorite in front of the fireplace.